Sean Dyche has has described tonight's trip to Old Trafford as a tough challenge - but added that it's not an impossible one. Manchester United's caretaker boss Ole Gunnar Solskjaer will be going for another record against the Clarets having already toppled Sir Matt Busby's achievement. Should the home side come out with all three points the Norweigan coach would become the first manager to triumph in his first seven Premier League matches in charge, surpassing the success of Carlo Ancelotti and Pep Guardiola. However, after avoiding defeat on their last two visits, Dyche is remaining optimistic, while retaining that sense of realism. "There's a reality to it, they're tough games and they're hard to get points from," said Dyche. "Performance is the king, yet again. That's what you're looking for. "I do think there always is that little bit of apprehension from a team, there has to be, because of the power of some of these clubs. "Equally, it brings that expected performance because Manchester United at home will be clear favourites, they've won all these games on the trot. Sometimes that can play in to the opposition's psyche. "A lot talk about the manager now, is he permanent now because of their run? All those little things can drift slightly differently in to the opposition as well as you. "They can alter things sometimes, it doesn't mean they will, but that all has to be factored in. In balance we go there with a little bit of freedom because all eyes are on them, there's expectation on them and once again we're the big underdogs. "It's just the way it is when you're playing these teams and they're going well. It's a tough challenge, but it's not an impossible challenge." The Burnley boss has been impressed with what he's seen of the Red Devils during the transition, with Solskjaer stepping in for Jose Mourinho last month. 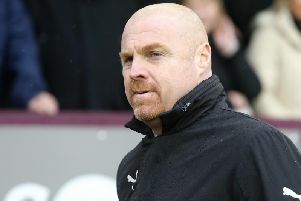 While the personnel remains the same, Dyche identified the energy and freedom within their performances and the character of the side as the key changes. "I don't think the fact that they are a good side has changed, I think there is just more of an emphasis on the energy of the side with a new manager bounce and a different feel it seems," he said. "From the outside looking in it seems like he has tried to loosen it a little bit and put a bit more freedom on it and a bit more energy seems to have been put back into the players. That is a skill in itself. "Maybe he has not changed too much, just changed the simple things and I think possibly that is what he has done in his own way. The players have responded and they are delivering good performances. There seems a little bit more spark."